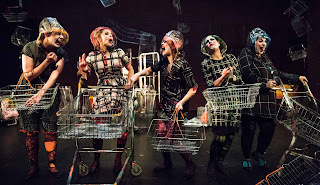 With the hoods of their transparent rain macs up over their heads, the five members of the Here We Lie cast turn into feverishly grotesque goblins who feed off other people’s misery, the kind of souls who swap sympathy for information in times of trouble. Meeting in the aisles of the local supermarket, they swap tales gathered from social media as well as the streets of Loughshea. When Brian (Antoinette Morelli with her hood down) admits to having an affair, Sharon McKevitt (Rosie McClellend) panics and screams out an even bigger revelation in retaliation. But she’s not dying. However, words can’t easily be unspoken. Particularly when your husband blabs all in the pub and the local gossiping goblins decide that they can “Make Loughshea Great Again” by wallowing in your misery and boosting their profile and sense of self-importance by arranging fundraising, cake sales, and all manner of publicity. In a time of need, everyone needs a friend. Enter Michelle (Louise Matthews) who has her own problems at home with unemployed husband Declan (Claire Connor) whose car accident while under the influence has created a financial meltdown. Meanwhile, mistress Paula (Bernadette Brown) has to contend with Brian’s conflicted loyalty. The community grief at first deafens their ears to the truth. And when some do realise what is really going on, they are too caught up in their own plans and misfortune to be able to set the story straight. The circle of lies and deception spirals out of control as the community’s need for the fake news to be real heightens. After the interval there are the inevitable confrontations; yet the revelations are pleasingly unpredictable if all the more shocking. Writer/director Patrick J O’Reilly’s has developed a sense of movement amongst the entire cast that accentuates the ghoulish and helps distinguish the gossiping witches from the main characters. 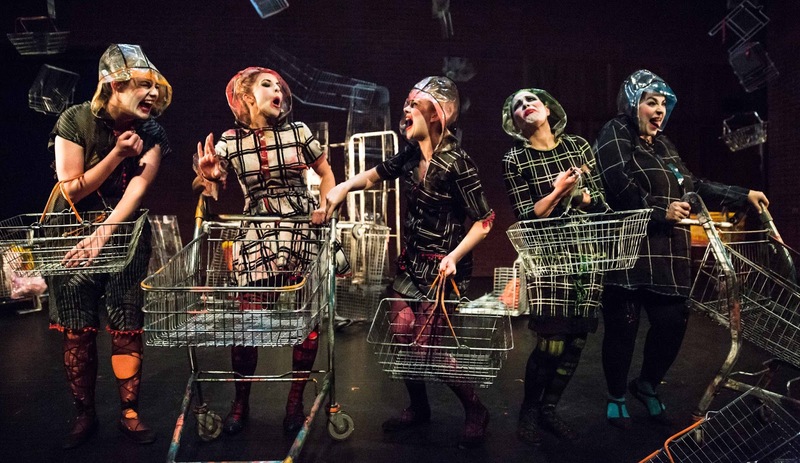 Niall Rea has created a dystopian world is which the entire set – including chairs, tables, beds, and walls – have been fashioned from supermarket trolleys and wire baskets. The only comfort comes from stuffed supermarket ‘bags for life’, perhaps referencing the temporary solace brought by money and the stuff it can buy. If the set wasn’t a big enough clue, Isaac Gibson’s sound design firmly places the opening scenes in a supermarket and the comical tannoy announcements add to the dark mirth throughout. 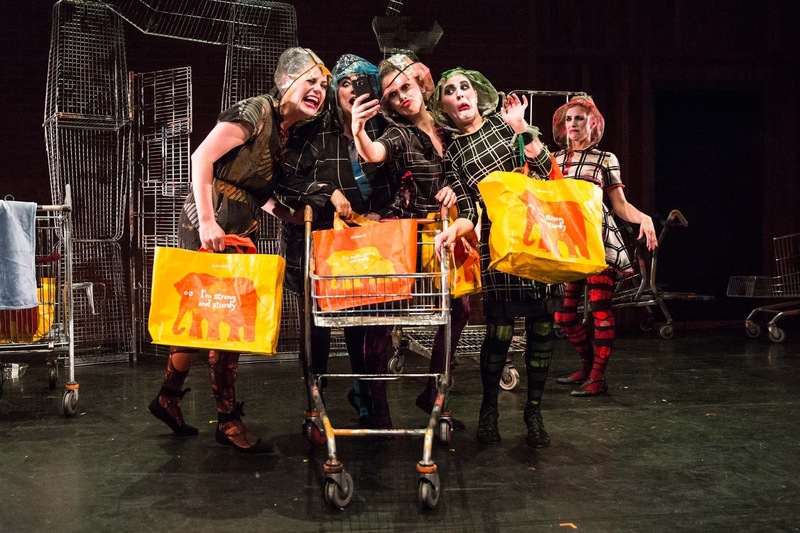 The Lyric Theatre are currently hosting two shows with all-female casts. (The Ladykillers continues its run until 8 July.) The two shows raise questions about gender and comedy: whether audiences perceive women as funny – or funny in the same way – as men? At times the script overly relies on cussing and swearing to generate the emotion of scenes. Bernadette Brown makes a fabulous jilted lover who challenges the cloud of deception and one stage intervenes without having to rely on over the top reactions. Louise Matthews has a superb repertoire of scowls that bring both Michelle and her rain mac-covered evil sprite to life. I never want to look out and see her at my window! Here We Lie is a dark and sobering morality tale that is sinister rather than silly and avoids being played as a farce which might have garnered more laughs. We watch a victim being scapegoated as the entire community figure out how to live with the consequences of their monstrosity. Individually we may recognise ourselves in the on stage victims or perpetrators. But on a grander scale, Northern Ireland society too knows all about scapegoating and the ongoing upshot of community lies and mistruths. Rawlife Theatre Company’s Here We Lie continues at the Lyric Theatre until 2 July. 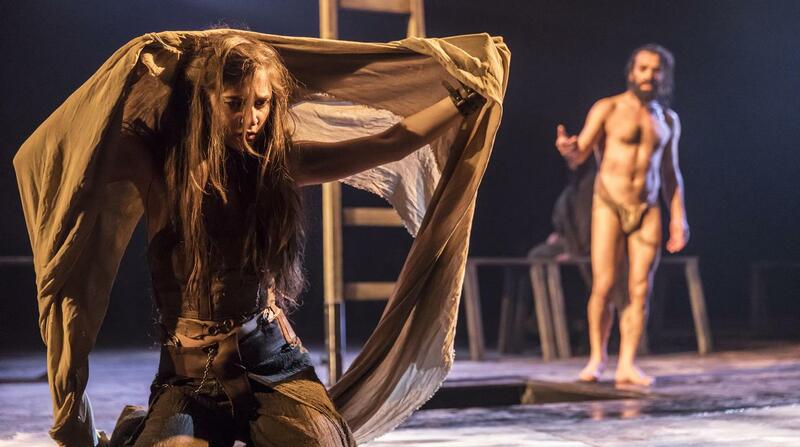 The National Theatre’s performance of Salomé was beamed into cinemas this evening as part of its NT Live programme. 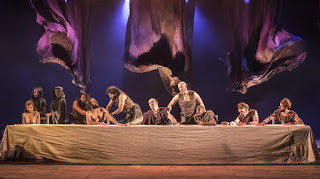 It’s a novel reworking of the tale that is briefly mentioned in the Bible but has been expanded in countless pieces of art and culture, not least in Oscar Wilde’s play which popularised the notion of a dance of the seven veils and formed the basis of the opera (most recently performed in Belfast by NI Opera back in February 2015). Yaël Farber’s version intertwines two stories of oppression and occupation: one political, the other personal. The prophet who preaches outside the authority of the Temple is willing to die but Herod the Tetrarch (Paul Chahidi) knows he must not kill John the Baptist (Iokannan the Zealot played by Ramzi Choukair) for fear of a popular uprising. So instead he is kept incarcerated in, force fed and forgotten. Herod lusts after his step daughter Salomé (Isabella Nefar). She in turn is fascinated by John and he inspires her to start her own sexual revolution with a ritual of passing through seven gates and casting off the accoutrements which so attract her perverse father (who fancies her as the next Queen of Judea) in order to find freedom. And so when he asks her to dance and give herself to him, the femme fatale in return calls for the one thing he truly politically fears. 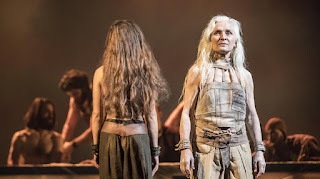 The story is narrated in flashback by an older ‘nameless’ Salome (Olwen Fouéré) who has been incarcerated and forgotten, much like the man whose death she requested. Pilate faces a deadline and is running short of time to extract the story from the woman who has kept her silence for so long. Susan Hilferty’s set of rotating concentric circles at times leaves the powerless going round in circles while the women take control. 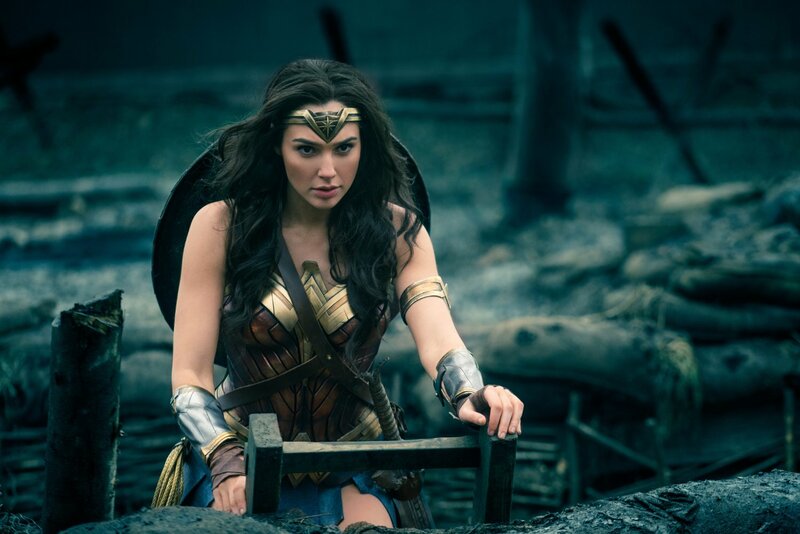 In fact that’s the point of this production: putting women back in control of a plot that has for so long been written by men projecting their own notions onto the women in the story. Metaphor piles on top of metaphor – much like the grains of sand that slip through Salomé’s fingers and form heaps on the stage floor – and her own violation seems to be mirroring the colonisation of Judea by the Romans. Overall, the novel adaptation of the story together with the big production values that would elude all but the largest producers of theatre made this version of Salomé a very worthwhile trip to the cinema. The only thing that spoilt it was not the obtuse and poorly poetic script. Now was it the dramatic use of big billowy curtains comes over a bit too Eurovision at one point. The downside of watching Salomé on the cinema screen was the ever so slightly aloof mindset of some fellow punters who talked louder than they normally would in the QFT. Someone even got up and went out, not to the toilet, but to the bar for a refill of coffee at one point. At least the incessant text message beeps that interrupted the play’s introduction were silenced by the time the actors stepped onto the stage. Salomé continues to run in the National Theatre's Olivier Theatre in London until Saturday 15 July. I think I may have a new contender for film of the year. Slack Bay. It’s French. It’s absurd. And it’s very funny. Set in 1910, the bourgeois Van Peteghem family make their annual summer pilgrimage to an old house that overlooks a north coast bay. It’s such a routine visit that they no longer fully appreciate the view. If they did look out the window, or turn their cliff top deckchairs towards the oyster pickers working in the low tide, they might have noticed that people are beginning to go missing with an alarming regularity. Directed by Bruno Dumont, the humour is both dark and visual. Ma Loute (Brandon Lavieville) is the eldest child of the bay’s ferryman who has a reputation for rescuing souls in peril out at sea. 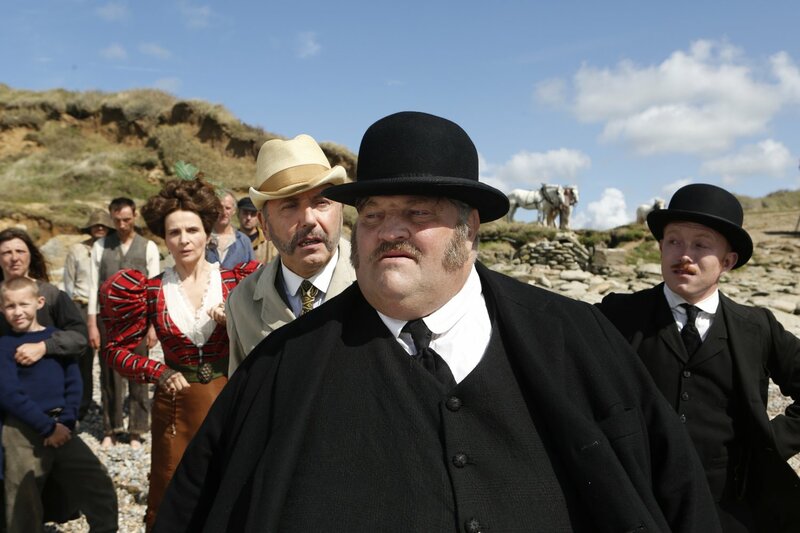 The child and his father have an unorthodox method of carrying people across the bay, though that’s nowhere near as surprising as the delicacies the mother serves up in their ramshackle home, morsels that are worthy of Jean-Pierre Jeunet’s Delicatessen. 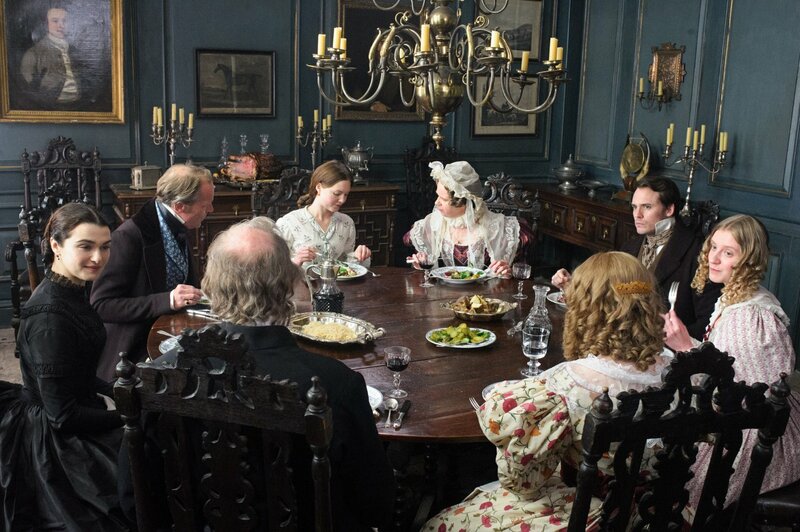 There’s a touch of inter-class romance as Billie Can Peteghem (Raph) catches the eye of Ma Loute, but not all is what it seems, and this upstairs-downstairs coupling again is nothing when compared to other familial revelations. Religious fervour is added to the mix along with a couple of bumbling detectives who throw themselves across the sand dunes like clowns to investigate the disappearances before coming across all Mary Poppins. 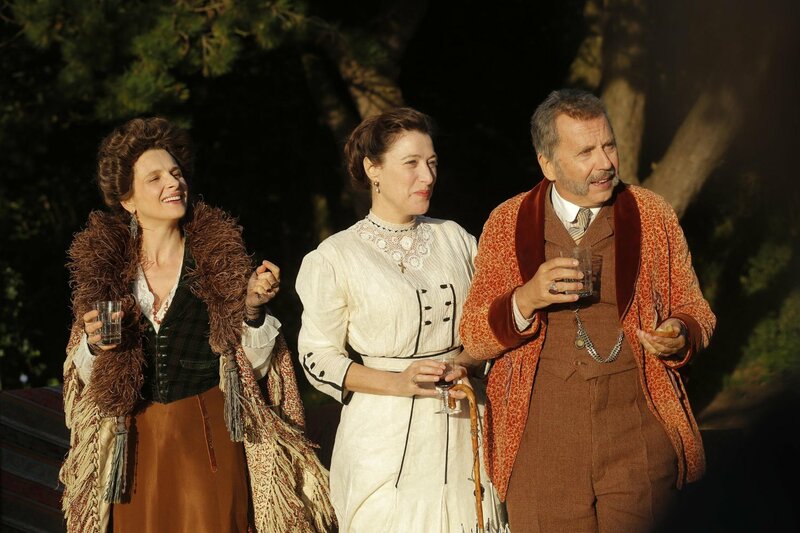 Throw in an ensemble cast that includes Juliette Binoche playing a highly strung sister and you have a cinematic winner. 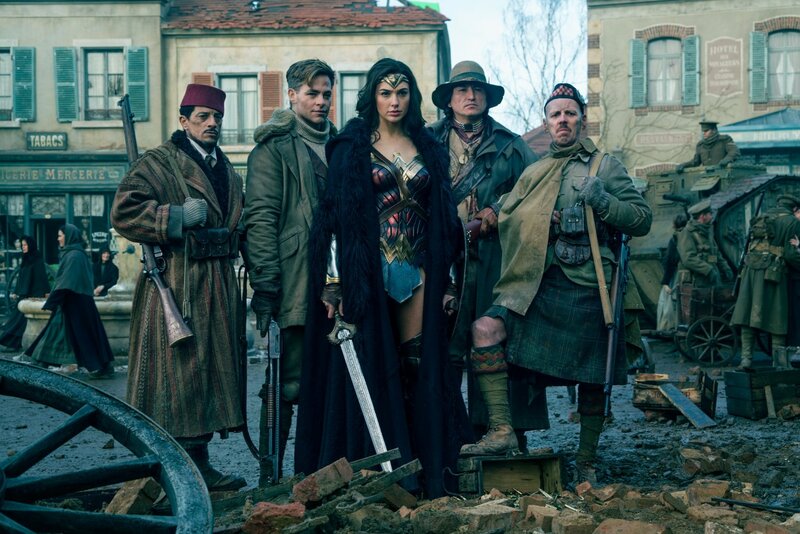 Slack Bay isn’t being screened in Belfast … yet. But it’s a great summer film that could be a word of mouth hit. 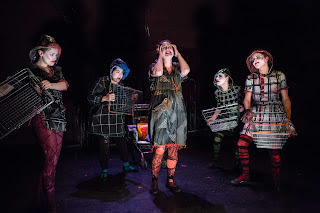 Over the last couple of year’s I’ve watched the character of Sinnead develop, through a scratch session at Accidental Theatre and then putting in a percussive appearance at Pony Panto in 2015. 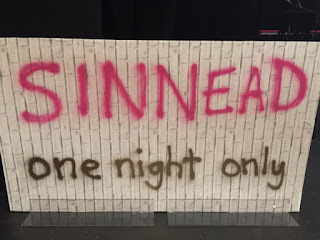 However, performing Sinnead: One night only … for two nights on the MAC’s big downstairs stage has put the wannabe pop star’s name in bright lights and may have swollen her head (and other parts) to a no doubt hard to manage size. Pregnancy hasn’t slowed down this artist. 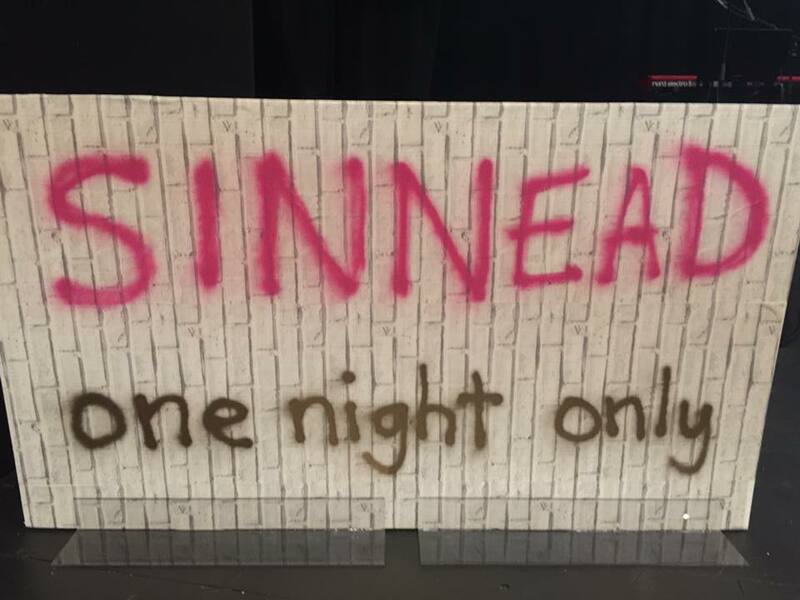 The no interval confessional show introduced adoring fans and new audiences to the origin story of how the Irish singing sensation Sinnead (pronounced ‘Sin-ne-ad’) came to live in Belfast. There’s plenty of devil in the detail of this show. The props were ridiculous, yet filled with fun and unpredictability whether a bin full of audience questions or a bicycle. At times, Sinnead was deeply irritating. Her diction was hard to app-re-she-ate. Her eyebrows looked like slugs. She surely scored low in any Insight exam at Leaving Cert. 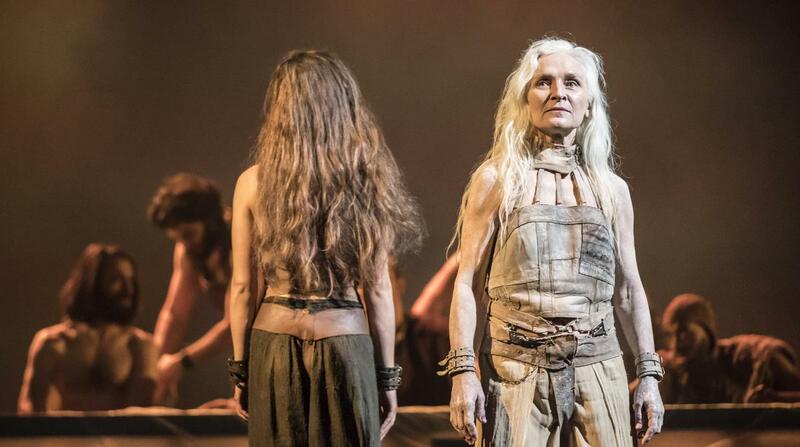 Yet Paula O’Reilly has filled out and rounded a fascinating creation to work up this extended show. A chavtastic track-suited band led by Donal Scullion provided the rich musical soundtrack for Paula O’Reilly and her two deliberately sullen backing dancers. Surprises abound with even the a couple of brass players being introduced with great theatre. Guests pop on stage and threaten to overshadow the star-billed phenomenon. Keith Singleton is O’Reilly’s real life partner. His on-stage appearance as Decky complete with a broad Belfast accent was a revelation. The people’s pop princess is at her strongest when rapping new parody lyrics over old familiar tunes (and rhyming ‘ordinary’ with ‘strawberry’). Dissonance abounds when she flips over to sing the melody. There’s something of the Ronnie Corbett to Sinnead’s style of elongated storytelling, with fewer off-topic diversions, but always with a fabulous last line to pay off at the end. The Beyoncé story would make a great parody YouTube video. The show finishes on a high with a new anthem for Andytown and the audience escape before any more people are singled out for special attention from the sharp-tongued minx. Paula O’Reilly’s alter ego has definitely grown in confidence. If good things come in small packages, then the challenge for Paula O’Reilly is harvest her fertile imagination and develop some more comedy characters to sit alongside (but never replace) Sinnead. Mrs Wilberforce is old and lives alone, tormenting the police with her paranoid notions of criminality in her locale. Professor Marcus rents out her space room and pretends to use it for music rehearsals with a group of friends, but instead the band of criminals are planning to rob a security van at the nearby railway station. 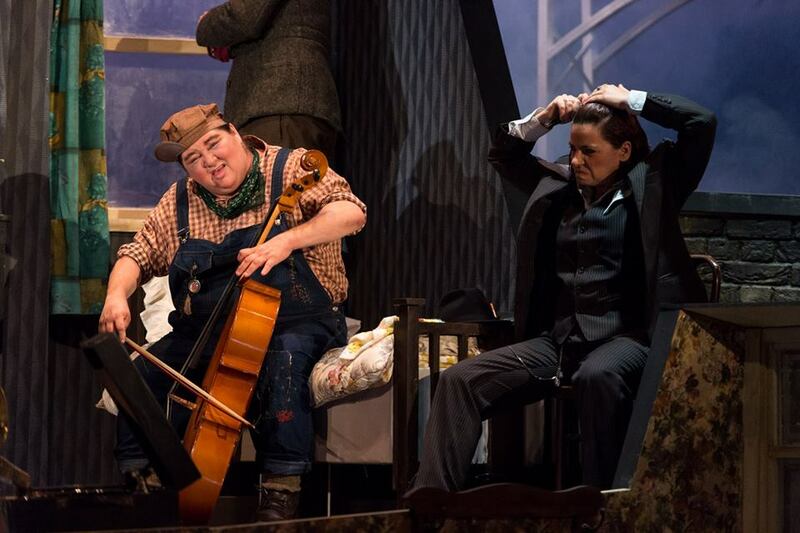 Lyric executive producer Jimmy Fay has taken Graham Linehan’s script for The Ladykillers – which adapts the original Ealing comedy film – and adds another layer on top, using a female cast to play the male criminals. While this could be seen as a crude response to the Waking the Feminists movement within Irish theatre, the resulting performances are less stylised and less predictable than they might have been with male actors, and instead inject extra off-beat humour into the piece. Stella McCusker’s portrayal of Mrs Wilberforce is warm and elegant, a character full of suspicion and curiosity. All the way through, there’s a feeling that there could be more to Mrs Wilberforce than meets the eye. Yet this production misses a trick by eliminating any notion of ambiguity in its conclusion. Abigail McGibbon plays the uber-confident Professor Marcus, a criminal mastermind with a cunning plan and an answer for everything and everyone. 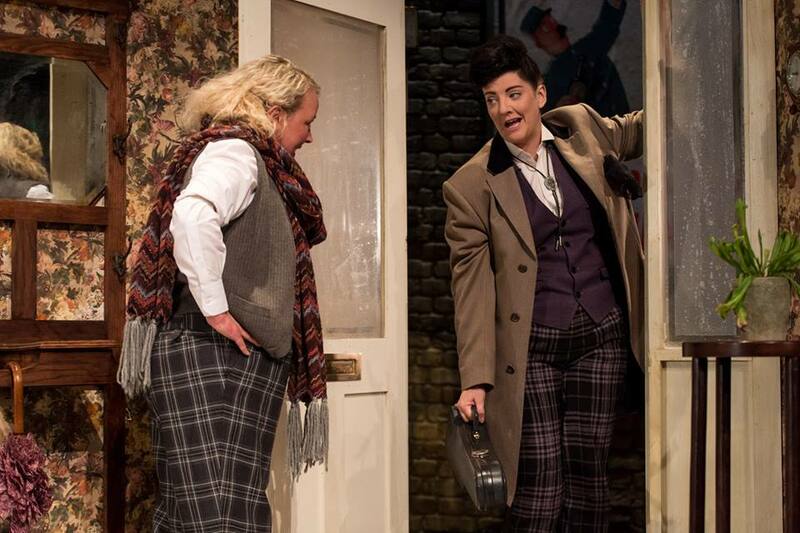 Julie Maxwell brings the kind of facial expressions that drive TV or film comedy to the stage role playing Harry Robinson, a light-fingered, OCD crook. Together with Jo Donnelly’s effeminate transvestite Major Courtney, the pair are a joy to watch. Maria Connolly scouts the room like an army squaddie on patrol though her version of Louis Harvey feels more like Italian Mafia than a violent Romanian criminal. 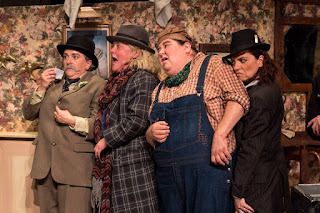 Cheryl Fergison brings ample buffoonery to the role of One Round, a gentle oaf of very little brain who can be relied upon to upset every situation. Nuala McKeever bends her knees as Constable Macdonald, the local bobby condemned to listen to Mrs Wilberforce’s far-fetched tales. And Christina Nelson makes a brief appearance that briefly adds colour and warmth to the play. The 39 Steps was another film adaptation brought to the stage of the Lyric last year in a co-production with Bruiser. It offered a high-conceit, fast-paced murder mystery set in 1935 which revolved around physical humour. In contrast, The Ladykillers is set twenty years later and relies on misunderstanding and misdirection as well as characterisation more than speed and knockabout comedy. Graham Linehan (Father Ted, Black Books, The IT Crowd) is well used to writing situation comedy and set-based productions. Yet his version of The Ladykillers is not packed to the rafters with jokes, nor is it totally farcical, which is a shame because the quality cast are capable of delivering gags and audiences would lap them up having come to the theatre more for entertainment than for the cleverness of complex performances. After the interval, both the heist and the pace of the play become derailed as Mrs Wilberforce realises that she has unwittingly become an accomplice and dissent breaks out amongst the gang which slowly self destructs. The cupboard scene is splendid, but the upstairs window is used a little too often (a problem with the script) and sometimes without much panache (the direction). 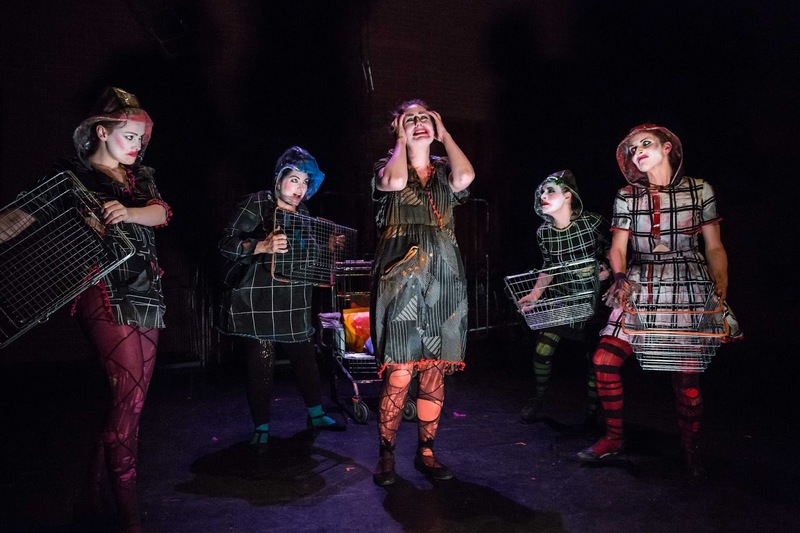 Stuart Marshall’s marvellous ramshackle set with its wonky walls fills the full height of the Lyric’s main stage with Mrs Wilberforce’s two floor flat and its view over the railway line, and supports the multi-level up stairs, down stairs, out windows comedy. There’s more than one “silly old bird” in the flat and the invisible parrot is a fun addition to the cast. Conor Mitchell’s sound effects and soundscape help anchor the piece in the 1950s and add a lot to the atmosphere. Graham Linehan’s version of The Ladykillers works well as an on-stage tribute to the original Ealing comedy film. 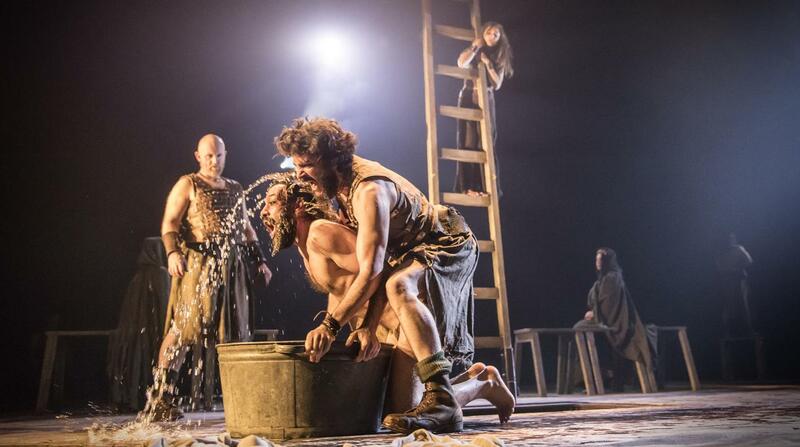 However, as a standalone piece of theatre for new audiences in 2017, its inherited pedestrian pace left me wanting more theatrical excitement despite the good performances. 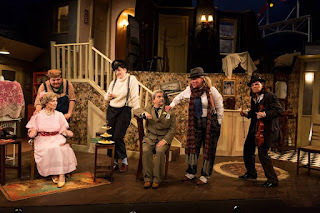 The Ladykillers is playing in the Lyric Theatre, Belfast until 8 July. 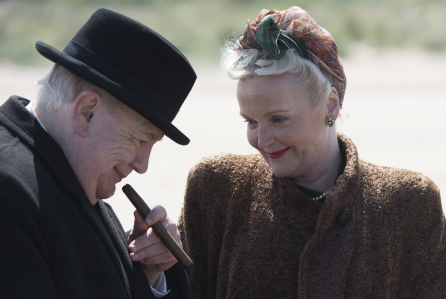 A new film Churchill hits the silver screen in cinemas today. It documents the four days leading up to the D-Day invasion of Normandy. 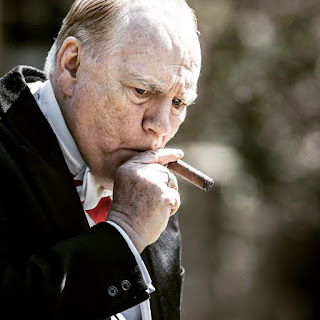 Churchill (played by the actor Brian Cox) wants to fundamentally change the Operation Overlord plans and the intervention of the PM – who is also Minister of Defence – is not appreciated by the military chiefs. The bulldog politician is irascible, troubled by the ‘black dog’ of depression and alcoholism. His relationship with Clementine (played brilliantly by Miranda Richardson) is strained, although ultimately she is the only person he seems to listen to. He sleeps long into the mornings. He shouts at a secretary. He insists on driving across the country to visit troops unannounced and demands to be able to address them. On screen Alex von Tunzelmann’s script introduces us to a driven yet unmanageable politician who is stressed by the state of the war and haunted by his own military failure in Gallipoli. He refuses to allow troops to become cannon fodder being sent to certain slaughter. It’s a very human and fragile Churchill. The figure whose speeches are still mimicked seems to have lost his speech-writing mojo. The man who was voted the Greatest Briton in 2002 has his leadership called into question. Two styles dominate the filmmaking: close-ups of Churchill that highlight his furrowed features, and very wide shots that leave human figures wandering like ants across the lower inches of the cinema screen. Smoke bellows from his nose. Jonathan Teplitzky’s depiction of Churchill and the wartime events may or may not take historical liberties. It may seem to drag even though it’s only 98 minutes long. But it succeeds in portraying the burden of leadership, the curse of being the one that people look to for hope, and the strain of having to give sacrifice purpose. Churchill is a fond yet troubling film and is being screened in the Queen’s Film Theatre as well as other local cinemas from Friday 16 June. 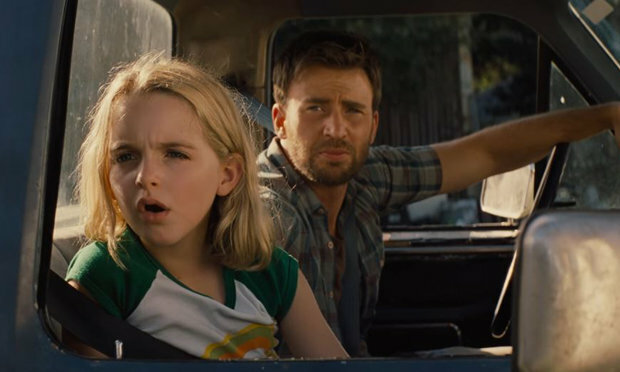 Gifted tells the story of a smart child called Mary whose uncle/guardian becomes locked in a bitter custody battle with his mother. Frank (played by Chris Evans) took on the role after his sister ended her life. Along with their one-eyed cat Fred – who is enough of a character to warrant a name – they move away from academic life in Boston and live simply in Florida. Now old enough to enrol in first grade at the local school, it is clear that Mary is the latest in a line of mathematical talent running through the family. Frank is trying to do the best for his young niece, getting it wrong one step at a time like most parents. But his legacy-obsessed mother Evelyn (Lindsay Duncan) – whose own numerical career was prematurely stunted through marriage and motherhood – upsets his finely balanced parenting equation. The film veers away from becoming overbearingly sentimental while still throwing in a few tear-jerking moments. The plot’s credibility that is built up over the first hour is wilfully discarded in the final stages which require far too much rescuing due to a decision we’ve come to believe Frank wouldn’t make. Weaknesses can also be found in the finer details. Why does a seven year old girl living with her unfashionable uncle have bleached hair? There are signposts towards competing attraction to Frank from Roberta (Octavia Spencer, who lives next door and cares for Mary each weekend) and the first grade teacher Bonnie (Jenny Slate). Yet this smoking gun of a plot line is never developed. The courtroom arguments don’t quite add up and the film’s fulcrum is hard to believe. The film gently raises questions about the nurturing and education of gifted children that will rattle around the minds of parents as they sit in the cinema. But it’s not a profound piece of drama. Evil maternal grandmother. Slightly hapless male parent. Arguing lawyers. A dodgy judge. Lying foster parents. 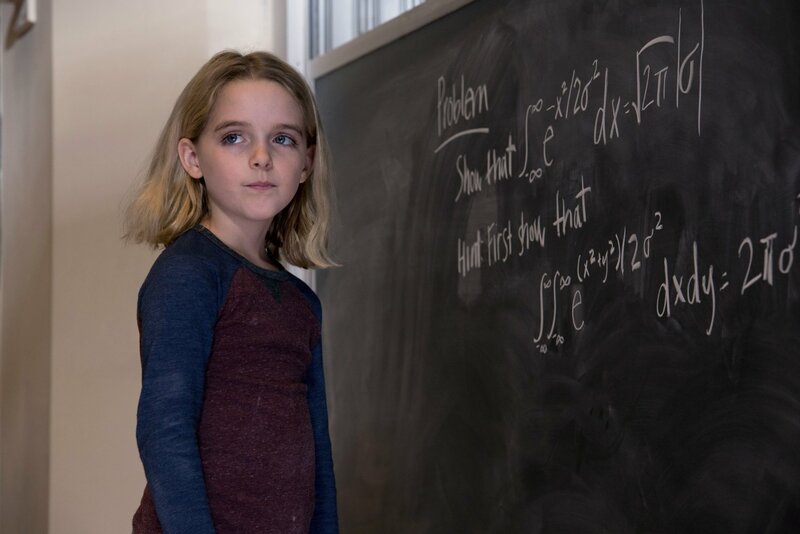 You could nearly write the script … except this predictable film is rescued by Mckenna Grace’s joyous delivery of her witty lines. The central parent/child relationship is convincing and their banter heartwarming. 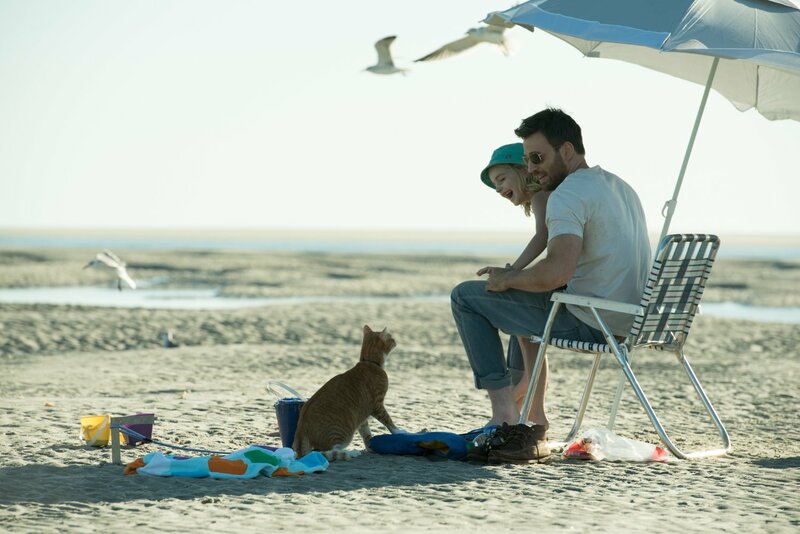 Gifted is being screened in Movie House Cinemas from Friday 16th. Thereafter it will become great family viewing when everyone’s stuck in the house at Christmas. After two days of hosting talks at the Data Studio as part of the Digital DNA conference and in the middle of election week, I hadn’t done any homework when I sat down in the Movie House Dublin Road to watch the preview of My Cousin Rachel. And my English Literature studies were cut far short of reaching Daphne du Maurier’s 1951 novel. The title conjured up the notion of a soppy romcom that I’d ultimately regret attending. So when the lights went down and a period drama with more cousins that I could count unravelled on screen it was quite a shock. Philip (played by Sam Claflin) receives a letter from Italy written by his dying guardian (a cousin) alleging maltreatment by his wife (another cousin). Despite travelling post haste, Sam arrives too late to see Ambrose before the brain tumour kills him. When the widowed Rachel (Rachel Weisz) comes to England – about twenty minutes inot the 106 minute long film – Sam is deeply suspicious and plots revenge. But he slowly falls under her spell and his perhaps ill-informed preconceptions melt away. Weisz injects a vulnerability into the stuttering Rachel who continually turning away from whatever behaviour you expect her to portray. The dialogue feels like it has been lifted straight from the pages of the novel. The colour of steeds feels symbolic. The osculatory sound effects are remarkably noisy. Infatuation. Disappointment. Benevolence. Scheming. One of the final scenes had everything needed to kick off of a new season of Broadchurch. Written and directed by Roger Michell, My Cousin Rachel is an unexpectedly captivating period whodunit that swerves away from becoming a revenge thriller but keep the audience guessing about the central characters’ motives right up to the end. Released on Friday 9 June, you can catch My Cousin Rachel in Movie House cinemas as well as the Queen’s Film Theatre, Odeon, Odyssey and the Omniplex chain.